Thanksgiving is a special day, and most of us will likely treat ourselves to food we would normally avoid. But if you are intent on eating low-carbs, even on Thanksgiving, here are a few Low-Carb Thanksgiving Ideas for you. Turkey is not a huge source of carbs but watch out for the gravy. 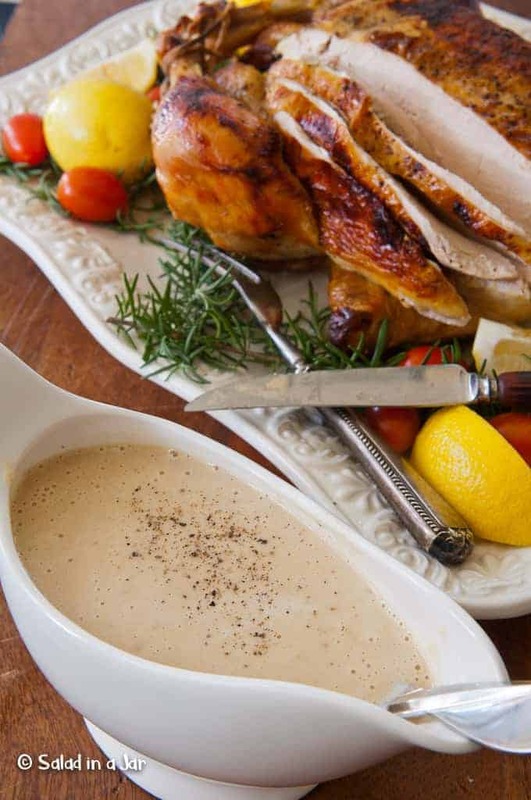 The gravy in this recipe calls for blending the pan juices and roasted onions in a blender, resulting in a totally yummy gravy with few carbs as no flour required. 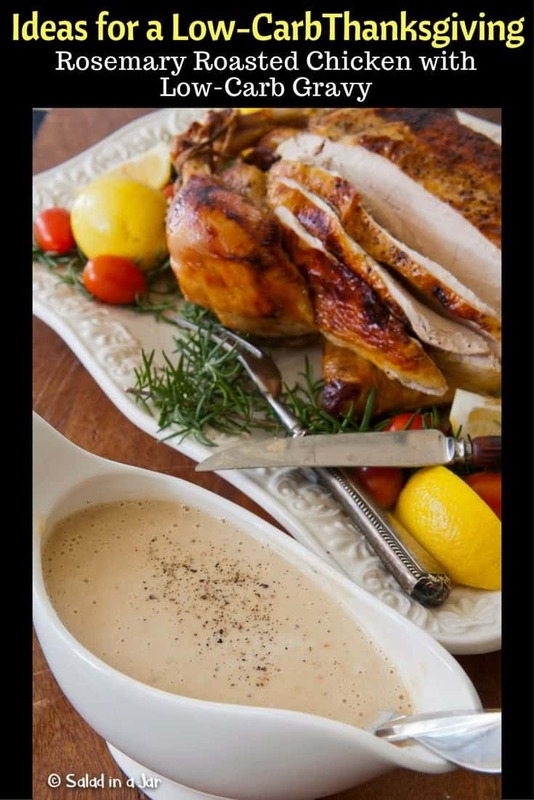 A serving of this chicken and gravy figures out to approximately 6.6 grams per serving based on six servings per recipe. Try the gravy poured over Not-Mushy Mashed Cauliflower. 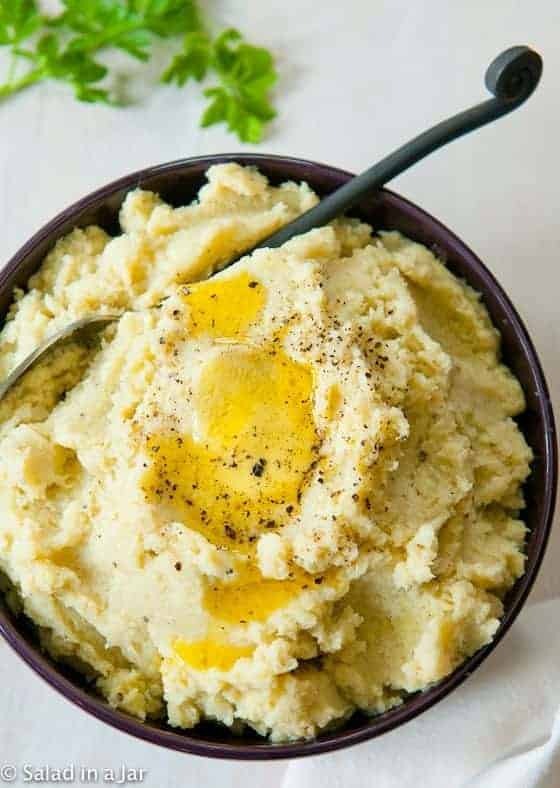 Check out my method for making mashed cauliflower with the best more-like-real-mashed-potatoes texture. Cover with highly flavored gravy, and you won’t miss the traditional whipped potatoes. 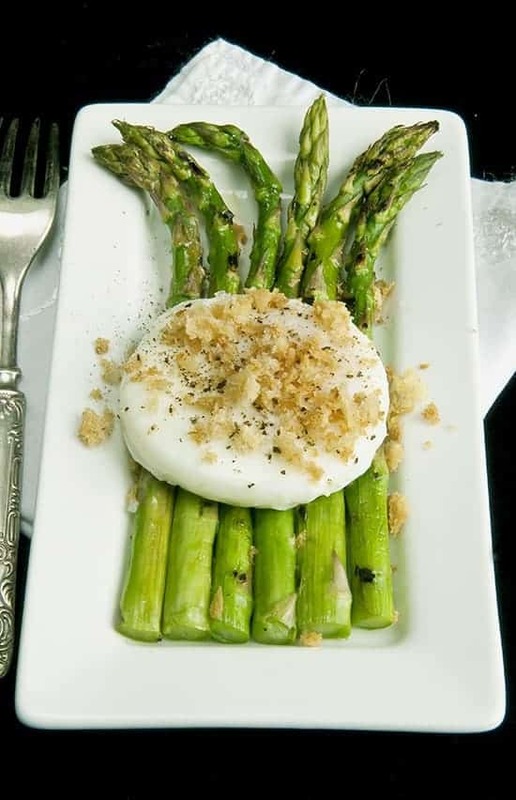 Poached eggs with a runny yolk provide an easy sauce for grilled asparagus. 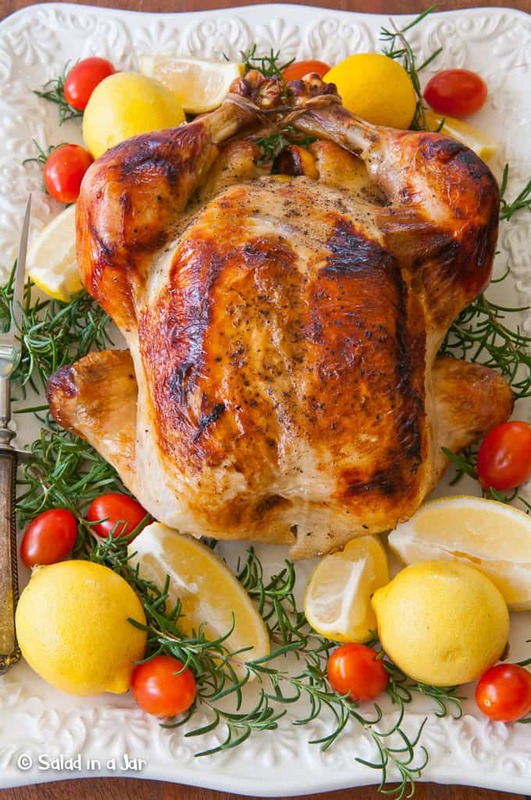 Cook on the grill, use a stove-top grill pan, or roast in the oven. No matter which method you choose, they won’t take long to cook. 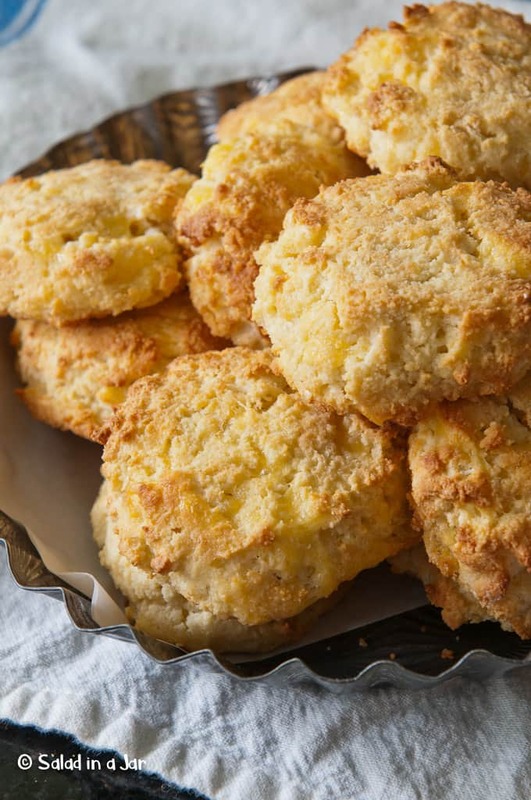 Leave off the bread crumbs, or crumble and toast the cheese biscuits shown below for a low-carb treat. If you need “bread” for your favorite dressing, or if you want to fill the void left by giving up flour-based dinner rolls, these biscuits are perfect for either purpose. If using these biscuits in dressing, slightly reduce the liquid called for in your dressing. Almond flour is less absorbent than wheat flour. You’ll know exactly how much to use after a little experimentation. 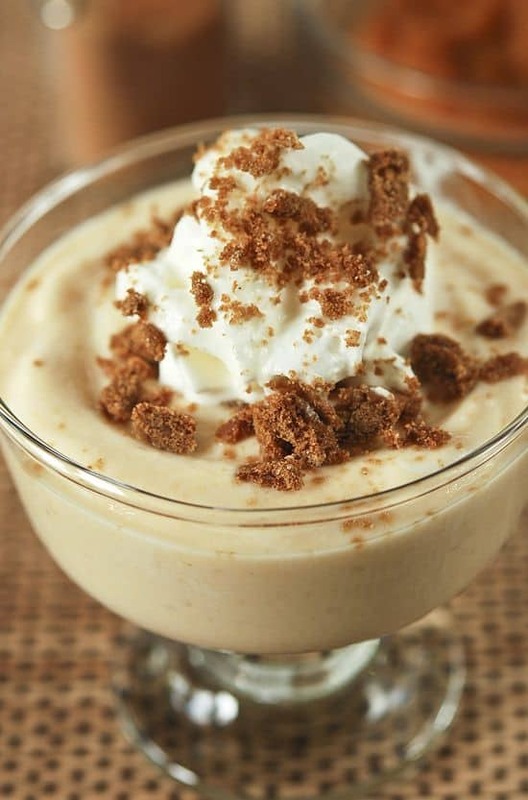 Add 1-2 tablespoons of canned pumpkin to your favorite unflavored yogurt or homemade yogurt along with a pinch of pumpkin pie spice and your favorite sweetener. Go festive and top with whipped cream, again sweetened with your favorite sweetener. The crumbled gingersnaps are optional, but leave them off if you are seriously curbing the carbs. All excellent ideas, Paula, but after cooking for a week to get ready for Thanksgiving, I am willing to give myself a pass on that day for carbs. I hope you have a wonderful holiday! Thank you Becky. Glad you are going to treat yourself. You deserve it. I probably will too.